What is the One-Way ANOVA? ANOVA is short for ANalysis Of VAriance. The main purpose of an ANOVA is to test if two or more groups differ from each other significantly in one or more characteristics. For some statisticians the ANOVA doesn’t end there – they assume a cause effect relationship and say that one or more independent, controlled variables (the factors) cause the significant difference of one or more characteristics. The way this works is that the factors sort the data points into one of the groups and therefore they cause the difference in the mean value of the groups. Example: Let us claim that woman have on average longer hair than men. We find twenty undergraduate students and measure the length of their hair. A conservative statistician would then claim we measured the hair of ten female and ten male students, and that we conducted an analysis of variance and found that the average hair of female undergraduate students is significantly longer than the hair of their fellow male students. A more aggressive statistician would claim that gender has a direct relation to the length of a person’s hair. Most statisticians fall into the second category. It is generally assumed that the ANOVA is an ‘analysis of dependencies.’ It is referred to as such because it is a test to prove an assumed cause and effect relationships. In more statistical terms it tests the effect of one or more independent variables on one or more dependent variables. It assumes an effect of Y = f(x1, x2, x3, … xn). The ANOVA is a popular test; it is the test to use when conducting experiments. This is due to the fact that it only requires a nominal scale for the independent variables – other multivariate tests (e.g., regression analysis) require a continuous-level scale. This following table shows the required scales for some selected tests. The F-test, the T-test, and the MANOVA are all similar to the ANOVA. The F-test is another name for an ANOVA that only compares the statistical means in two groups. This happens if the independent variable for the ANOVA has only two factor steps, for example male or female as a gender. The T-test compares the means of two (and only two) groups when the variances are not equal. The equality of variances (also called homoscedasticity or homogeneity) is one of the main assumptions of the ANOVA (see assumptions, Levene Test, Bartlett Test). MANOVA stands for Multivariate Analysis of Variance. Whereas the ANOVA can have one or more independent variables, it always has only one dependent variable. On the other hand the MANOVA can have two or more dependent variables. Medicine – Does a drug work? Does the average life expectancy significantly differ between the three groups that received the drug versus the established product versus the control? Sociology – Are rich people happier? Do different income classes report a significantly different satisfaction with life? Management Studies – What makes a company more profitable? A one, three or five-year strategy cycle? Let’s consider our research question from the Education studies example. Do the standardized math test scores differ between students that passed the exam and students that failed the final exam? This question indicates that our independent variable is the exam result (fail vs. pass) and our dependent variable is the score from the math test. We must now check the assumptions. First we examine the multivariate normality of the dependent variable. We can check graphically either with a histogram (Analyze/Descriptive Statistics/Frequencies… and then in the menu Charts…) or with a Q-Q-Plot (Analyze/Descriptive Statistics/Q-Q-Plot…). Both plots show a somewhat normal distribution, with a skew around the mean. Secondly, we can test for multivariate normality with the Kolmogorov-Smirnov goodness of fit test (Analyze/Nonparacontinuous-level Test/Legacy Dialogs/1 Sample K S…). An alternative to the K-S test is the Chi-Square goodness of fit test, but the K-S test is more robust for continuous-level variables. The K-S test is not significant (p = 0.075) thus we cannot reject the null hypothesis that the sample distribution is multivariate normal. The K-S test is one of the few tests where a non-significant result (p > 0.05) is the desired outcome. If normality is not present, we could exclude the outliers to fix the problem, center the variable by deducting the mean, or apply a non-linear transformation to the variable creating an index. 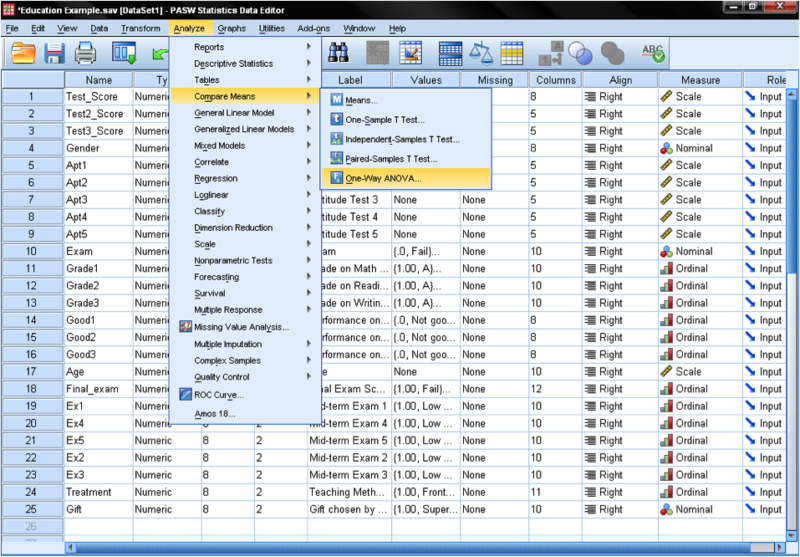 The ANOVA can be found in SPSS in Analyze/Compare Means/One Way ANOVA. In the ANOVA dialog we need to specify our model. As described in the research question we want to test, the math test score is our dependent variable and the exam result is our independent variable. This would be enough for a basic analysis. But the dialog box has a couple more options around Contrasts, post hoc tests (also called multiple comparisons), and Options. In the dialog box options we can specify additional statistics. If you find it useful you might include standard descriptive statistics. Generally you should select the Homogeneity of variance test (which is the Levene test of homoscedasticity), because as we find in our decision tree the outcome of this test is the criterion that decides between the t-test and the ANOVA. Post Hoc tests are useful if your independent variable includes more than two groups. In our example the independent variable just specifies the outcome of the final exam on two factor levels – pass or fail. If more than two factor levels are given it might be useful to run pairwise tests to test which differences between groups are significant. Because executing several pairwise tests in one analysis decreases the degrees of freedom, the Bonferoni adjustment should be selected, which corrects for multiple pairwise comparisons. Another test method commonly employed is the Student-Newman-Keuls test (or short S-N-K), which pools the groups that do not differ significantly from each other. Therefore this improves the reliability of the post hoc comparison because it increases the sample size used in the comparison. The last dialog box is contrasts. Contrasts are differences in mean scores. It allows you to group multiple groups into one and test the average mean of the two groups against our third group. Please note that the contrast is not always the mean of the pooled groups! Contrast = (mean first group + mean second group)/2. It is only equal to the pooled mean, if the groups are of equal size. It is also possible to specify weights for the contrasts, e.g., 0.7 for group 1 and 0.3 for group 2. We do not specify contrasts for this demonstration.